While out looking for a Halloween costume for the boy, I found myself in the same shopping center as Total Wine. So, I thought that I while I was getting something for him, I might as well get something for me. As a part of a mixed six, I picked up a couple of seasonals (Oktoberfests and Pumpkin Ales); one of those was the Ichabod Pumpkin Ale from New Holland. I chose the bottle in part for the label (I do love pretty packaging) as well as past experience with the brewer. I have had their Full Circle Kölsch (which I loved) and The Poet (which was okay). New Holland is the brainchild of Jason Spaulding and Brett VanderKamp who founded the brewery in Holland, Michigan in 1996. They have eight beers in their regular lineup, a number of seasonals and also distill whiskey, rum and gin. 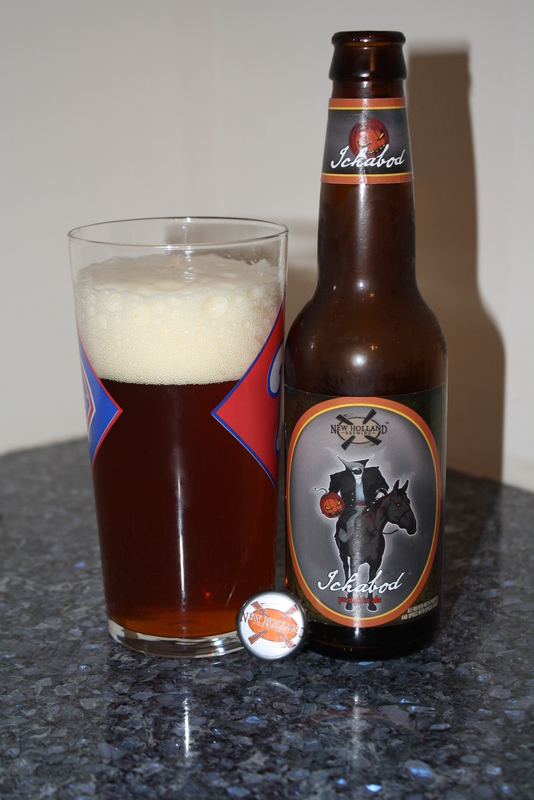 Ichabod combines malted barley and real pumpkin with cinnamon and nutmeg in a delicious and inviting brew. A rewarding complement to many dishes, Ichabod pairs well with autumnal foods such as poultry and root vegetables. After dinner, try it with your favorite dessert! Appearance: Dark Amber (almost ruby tinged) with a lot of slowly dissipating foam and good lacing. Aroma: A little muted with hints of malt, citrus, hops and pumpkin spices. Taste: Crisp, refreshing, well-balanced with a lingering hoppy-pumpkiny finish. Not a lot of carbonation, but very creamy. I’m not a big fan of pumpkin beers as to me they tend to be a little too much like a churned glass of pumpkin pie. This was not the case with the Ichabod. This was a very well-balanced beer and drinkable beer. Spot on with the review. I enjoyed this down in KC visiting friends and was hoping to see it in Iowa but no go. If you get a chance to try O’Fallon’s pumpkin ale I would love to see what you think of it! Thanks. I’m not sure if O’Fallon’s comes to Southern NJ, but I will keep an eye out for it. I’m a fan of New Holland from the limited amount of times I’ve been able to sample their products. I haven’t had the Ichabod, but if nothing else, it’s a great name for a pumpkin beer. So many of them are really cliché in their marketing. And, while the contents were very nice, I think I liked the label even more. Like you, I’ve never been a fan of pumpkin beers. However, this one sounds a bit intriguing. If I can find it in LA, this could make for a good Thanksgiving Day addition. This one really surprised me. Happy Hunting!